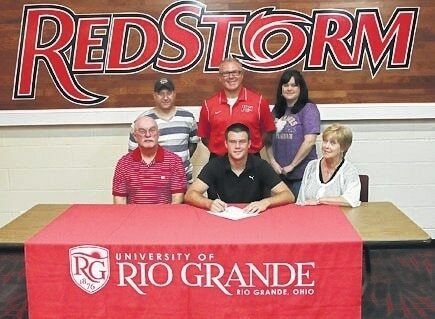 Southern ace Jack Lemley signed his letter of intent recently to join the University of Rio Grande baseball team next season. “It feels amazing, I’m chasing a dream that I’ve had since I was six years old,” Lemley said. “Rio Grande’s been my favorite college baseball team since I came to my first game when I was eight years old.” Lemley, a 6-2, 195-pound pitcher, posted a 3-6 record with two saves and a 4.59 earned run average for the Tornadoes, which finished the 2015 campaign with an 8-16 record following a loss to Trimble in the quarterfinal round of Division IV district tournament play. Lemley was named a first team All-Southeast District selection by the Ohio High School Baseball Coaches Association and was also a first team All-Tri-Valley Conference Hocking Division pick this season. Among the right-hander’s three victories this season was a 13-0 perfect game triumph over South Gallia in which he struck out 14 of the 15 batters he faced. “Jack has a wealth of potential,” said URG head coach Brad Warnimont. “His biggest challenge will be getting adjusted to the college game. Once he accomplishes that, I think you’ll see him make an impact on the program.” Jack, who is the son of Jill Hankinson and Rick Weaver of Rutland, has yet to decide on a field of study.Pictured above is Jack Lemley is joined by family members and Rio Grande head baseball coach Brad Warnimont as he signs to continue his career for the RedStorm.